We spent most of August on holiday in France so I arranged for some automated posts while I was away. No one wants to spend longer in the kitchen than they have to when the weather is warm and it is lovely outdoors. Sadly the weather has been less than perfect this year. 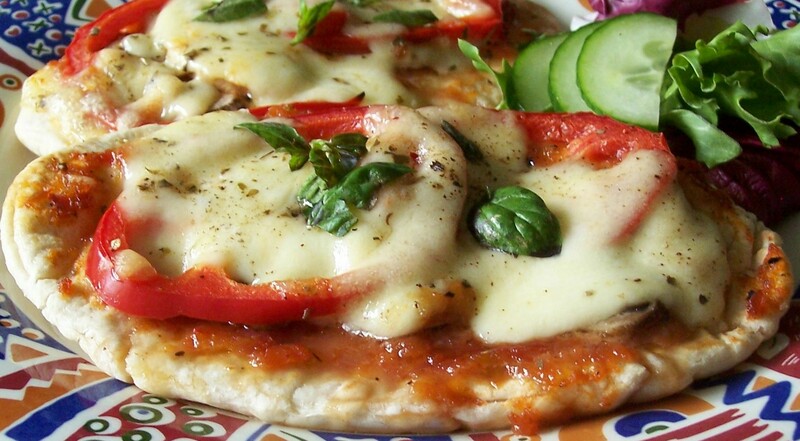 On the few really good days we had I was pleased to be able to make some simple snacks such as Cheese & Tomato Tortilla Bake, served with some quickly grilled meat, or Pitta Pizzas both of which were accompanied by a side salad. Also on the menu was Welsh Rarebit, an old family favourite and a perfect light snack at any time of year. Marinaded Feta, Hummous and Pesto Hummous are also good eaten as a light snack and perfect for a summer buffet. I love salad meals in the summer and so I am always on the lookout for new and tasty sounding mixtures, ingredients and marinades. One salad recipe which I have been making for a number of years is Mixed Bean Salad, which has a choice of two different marinades: both are delicious, so it is difficult to choose my favourite. 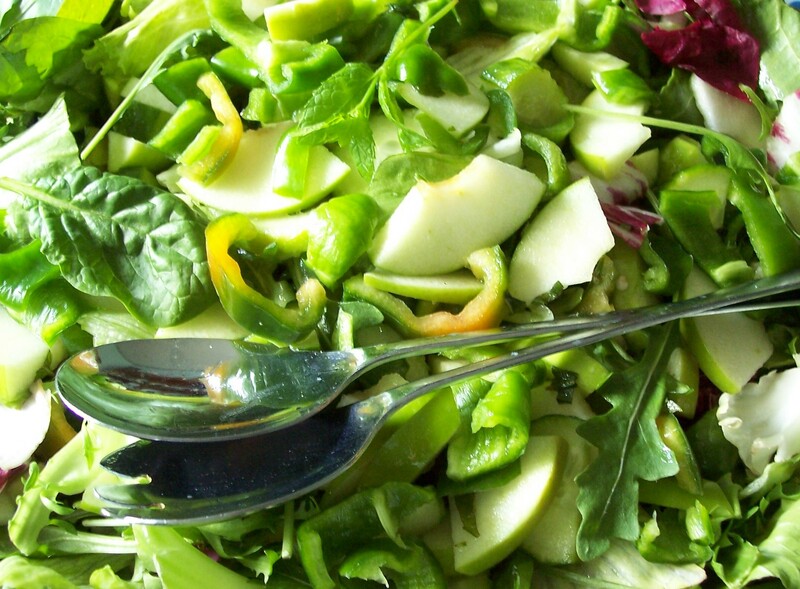 Minted Apple Salad was the result of an experiment using cider vinegar and the recipe for Tzatziki Potato Salad was another experiment using yoghurt based tzatziki as a dressing for cold potato in place of the usual mayonnaise. 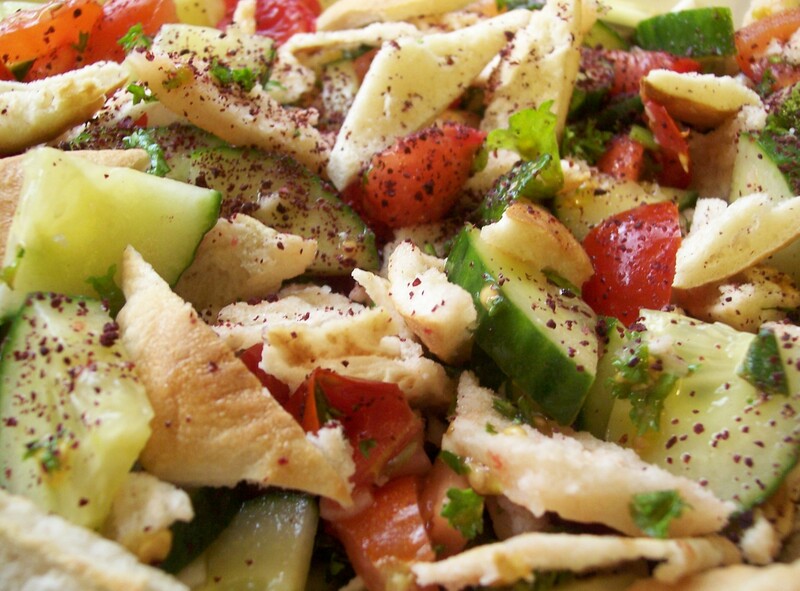 Finally, I added the delicious Middle Eastern Fattoush Salad in advance of posting (in September) the delicous Za’atar Chicken with which it should be served: both from recipes by Nigella Lawson. This year we travelled to Haute-Savoie in the French Alps for our summer holiday not far from the Swiss and Italian borders. We were based on a lakeside campsite at the southern end of beautiful Lake Annecy, but as usual we made our way slowly there, looking and tasting as we went. There were many foodie delights along our way, some of which I hope may make an appearance in these pages if I am able to find both recipe and ingredients. We ate with ex-pat English friends who served us Gesiers in a salad (literally gizzards, which some people might be inclined to turn their noses up at, but it definitely is a case of ‘don’t knock them until you have tried them’). With the same friends, were served an extensive cheese board including Chaource, Mimolette Ancienne and several types of Brie. We also tried some other cheeses, including Morbier which has a creamy texture and a thin blue vein running through the centre. The Alpine region is well known for its cheeses. Apart from the well known Fondue, which we did not eat this time, one of the best known dishes is Tartiflette, a delicious mixture of bacon, onion, cheese, mushrooms and potato. (I made this at home before I went and it makes a regular appearance as a quick meal.) On a day out from Lake Annecy we visited Beaufort, watching the fascinating cheesemaking process in the Coopérative Laitière, then buying and eating some of the cheese we had watched being made. We enjoyed Jambon Sec, dried ham, several times in salads at restaurants and when self-catering: it is becoming more readily available here in the UK, but is still difficult to find and often rather expensive. Freshwater fish is found on many menus. At one restaurant I had a delicious Trout Meunière and in another Sandre or Pike-perch (called this because it is like a cross between the two fish). Memorable desserts were Mousse aux Myrtilles (delicately amethyst coloured from the bilberries and served in a tiny taster cup), Pineapple Coconut Tarte Tatin (something to try at home: a rum sprinkled ring of pineapple on a coconut crumble base) and Iles Flottante (Floating Islands – always a favourite). On the way home we dined with some French friends and they gave me their recipe for Flan, a very traditional French dessert which I will eventually post here. There was one very unusual ingredient discovery as well, the famous red Poppy (or Coquelicot). Coquelicots de Nemours (named after a town South East of Paris, not far from Fontainebleu) is a sweet created in 1870 from poppyseed, fruit paste and liqueur. We found Coquelicots de Nemours as a delicious jam at breakfast at our Ibis hotel in Fontainebleu, but were unable to find it in the supermarkets: I expect it is very regional so I will keep looking on future holidays. It was also available as a special ice cream flavour in the chain restaurant Flunch: always a place worth looking out for in France if you want an inexpensive quick meal. As always, we returned with wonderful French ingredients which are mostly unavailable in the UK: Walnut Vinegar, Raspberry Vinegar, Sea Salt (from Guérande, where we holidayed some years ago), olive oil, Confiture de Lait (or Dulce de Leche), cheeses (goats cheese, Chaorce, Mimolette Ancienne, Beaufort, Morbier, Reblochon and Emmental), pate, Spicy Beef Merguez and Chipolata Pork Sausages (totally different in taste to the ones available in the UK), Gesiers (which can be bought ready prepared and vacuum packed, so preparation is unnecessary) – and of course liqueurs and wines. I also managed to buy some really inexpensive individual tart tins in two shapes: not sure how I will use them but I could not resist. 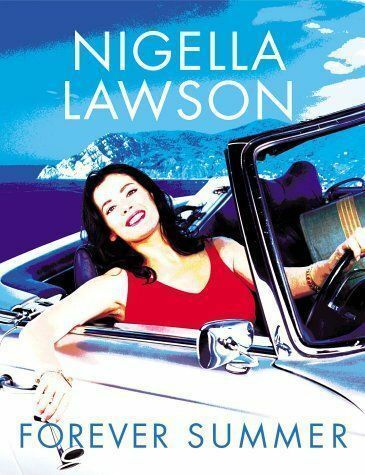 I have enjoyed browsing though Forever Summer by Nigella Lawson which has a wealth of lovely summery recipes. My copy came from the library but I may just have to invest in a copy of my own. This book is the source for Middle Eastern Fattoush Salad and Za’atar Chicken. Other recipes that have caught my eye are: Keralan Fish Curry with Lemon Rice, Moroccan Roast Lamb (using the delicious spice mixture Ras el-Hanout), Chicken & Cashew Nut Curry, Gingery Duck with Red Onion & Orange Salad, Hasselback Potatoes (so simple – so attractive! ), Banana & Butterscotch Upside Down Tart, Lemon Rice Pudding, Figs for 1001 Nights & Gooseberry & Elderflower Ice Cream. UK foodie site … Cherrapeno ‘A cherrapeño is the result of a cross between a cherry pepper and a jalapeño chilli pepper’, writes Nic at the top of her blog page. 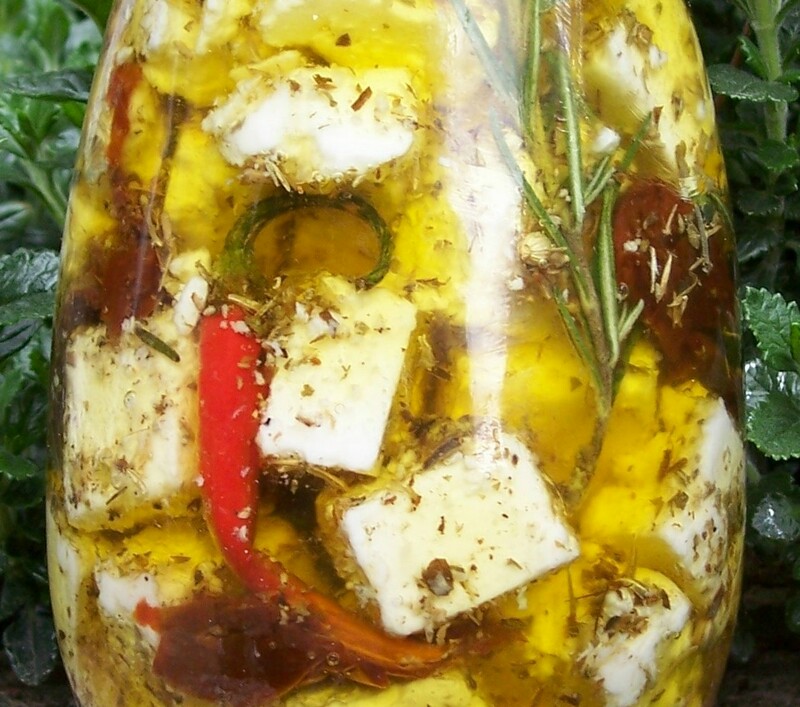 I was inspired by one of her recipes, which led to my post this month for Marinaded Feta. True to form, there was a red chilli in the jar giving a great spicy flavour but not all recipes on the site contain chillis. I like the look of Frozen Raspberry Kent Mess (I make a normal version, but have never thought to freeze it), Chelsea Buns (I’ve made these before but must do so again!) and Sablés (a butter biscuit which we have eaten in France) with a caramel glaze. Non-UK foodie site … My French Kitchen (Allow me this one, after all I have just come back from France and am pining for it already…!) Ronelle’s site is a beautiful mixture of recipes with photos of France and artwork. This lovely combination appeals as I love France and enjoy drawing and painting as well as cooking, although for me it is mostly a holiday hobby. These caught my eye for the recipe as well as the illustrations: Tomato and Goats Cheese Tartlets, Mackerel Pate and Crystallized Orange Strips. …and something else – The Old Foodie A fascinating Australian based site giving anecdotes about the history of food in a plethora of well researched subjects. Each time there is a detailed history, recipes and a clever and often connected quotation. See Sorbet Story, Fragrant Food, Bubble & Squeak and Eating à la Française. Coming in September … a selection of ideas for cooking and using Chicken plus some French Style recipes. Collette Rossant recounts in memoir and in recipes a snapshot of her early life. In 1937, aged five, she arrived in Cairo from Paris with her Egyptian/Jewish father and French mother. On the death of her father, her mother returned to France and Collette remained with her wealthy grandparents. At age fifteen she was summoned to Paris to join her mother, never to see her grandparents again. Before going to Cairo, even as a very young child, she loved the Parisien kitchen, but her maternal grandmother thought it was no place for her to spend time: “Une jeune fille de bonne famille ne fréquente pas la cuisine!” (A young girl of good breeding does not go into the kitchen!) In Cairo entering the kitchen was not a problem. Collette recounts tales of the happy and seemingly carefree lifestyle of her childhood: the welcoming kitchen, where she learned so much from Ahmet the cook and her grandmother, the sights and sounds of shopping in the bazaar and the sumptuous meals she remembers. 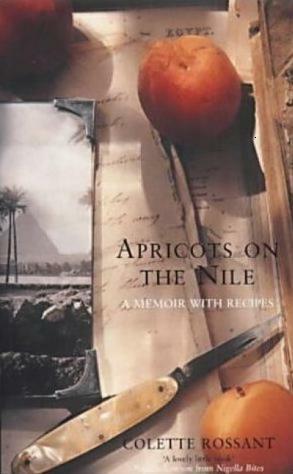 The final chapter of Apricots on the Nile tells how Collette, thirty years later and a journalist and food writer, retraces her steps. She rediscovers the Egypt of her past, trying to find again the places with their remembered sights, smells and tastes. I loved this book with its honest account of Collette Rossant’s unusual childhood before and around the time of World War II, the sadnesses as well as the happy times, giving a window onto a world now gone for ever. I loved too the unusual recipes, both Egyptian and French. One in particular, Grilled Chicken with Sumac & Roasted Banana, we thoroughly enjoyed and my variation the recipe is included on this site. There are many other delicious sounding recipes, including: Semit (soft sesame seed covered pastries) and Sambusaks (cheese filled pastries), Ta’miyya (like Felafel), Babaghanou (roasted aubergine puree, served as a dip), Stuffed Vine Leaves (filled with rice, lamb and cumin), Chickpea Purée and Traditional Hummus, Lentils and Beetroot with Swiss Chard, Fricasée of Fennel, Bean Soup and Apricot Pudding (a rich dessert of baked pureed dried apricots), plus from Collette’s time at the convent school, Soeur Leila’s Red Lentil Stew and Lentil Soup. According to the Bloomsbury website, Collette Rossant has written two further ‘memoirs with food’, neither of which I have read, but I will try to track them down as I hope they are equally as enjoyable. I have also found reference to a book on Collette Rossant’s own website, supposedly the third in her series, called A World in my Kitchen: The Adventures of a (Mostly) French Woman in New York. It is not clear whether this is Madeleines in Manhatten under a different title, or a new book. Collette is also the author of several cookbooks, on a variety of subjects including Kosher Cooking, Japanese Cuisine and Slim Cuisine. As part of our holiday to Brittany, France, we planned to spend several days in Normandy, so when I spotted Tarte Tatin on the library shelf it seemed a perfect book to take with me to get a flavour of the region. This second book, Tarte Tatin, has plenty of local colour and character in its tales of village life, with tales of shopping in the local market and enjoyable meals shared with a jolly sounding group of friends. With the family, now numbering four, having settled into the community and putting down roots, the dream to open a cookery school finally becomes reality. The book is filled with food related information with plenty of recipes to try out, most feeling French but with an American twist. On return from holiday I made Loomis’ Raw Beetroot Salad, which I have already posted: an extremely simple recipe which was a great success. There were plenty of other recipes that caught my eye and which I hope to eventually try out. Corn Bread, Allspice Ice Cream, Ginger Madeleines, Rosemary Baked Potatoes, Three Nut Biscotti and Winter Fruit Tarte Tatin caught my eye in particular. Susan Loomis has also written recipe books, including Farmhouse Cookbook, French Farmhouse Cookbook and Italian Farmhouse Cookbook. Last time I wrote one of these updates I was looking forward eagerly to our French holiday, but that has long since gone and since I have been back it feels as if my feet haven’t touched the ground. I have cooked several delicious recipes since our return and I will try to add them in the coming weeks. We managed to find the sunny weeks in the midst of what was mostly a very disappointing summer and Brittany was as pretty as I remembered it from my previous visits. We ate a memorable meal on our very first night travelling through Normandy en route to Brittany – always good to have a promising start! Brittany, it seems, has a Crêperie on every corner and several times we ate Galettes: sarraisan or buckwheat pancakes with a savoury filling (crêpes usually have a sweet filling). The region is famed for its seafood: we ate Moules Marinières, Coquilles St Jacques (as a Galette filling) and fresh Sardines in the town of Quiberon, with its canning industry and sardine festival. Sweet regional food included Crêpes, the sweet pancake eaten either plain with melted butter and sugar or with any one of a variety of fillings and Kouign Amann, a butterscotch flavoured sticky cake, but I was disappointed not to see ‘Far’ on sale very often. 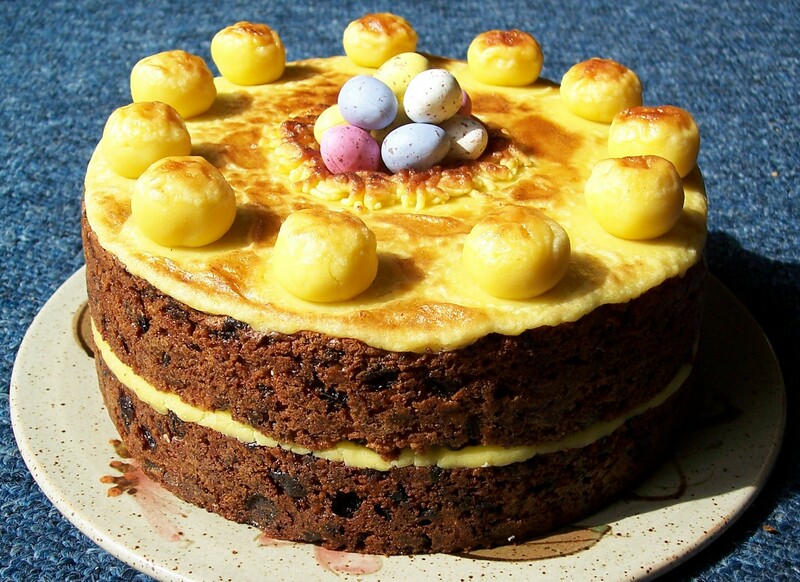 (Never mind, I can at least make that one at home – I have posted an excellent recipe for Far Breton on this site!) Finally, rather than wine, we drank Breton cider and also Kir Breton: a mixture of fruit liqueur and cider (blackberry liqueur was particularly good). I had a break from posting recipes while I was away so there are very few updates for August. Before I went away I posted the recipe for Melon & Ginger Ice Cream and once I came back, having been inspired by a book I read on holiday I made and posted a recipe for a tasty and unusual Raw Beetroot Salad. This recipe came from Tarte Tatin: further adventures in a small French town by Susan Loomis, about which I wrote a review and I look forward to trying a few more of Loomis’ delicious sounding recipes. I have discovered a fascinating little book called In the Devil’s Garden: a sinful history of forbidden food by Stewart Lee Allen. No recipes, but lots of fascinating foodie facts and theories. I will be trying out a few French style ideas in the next month or so, trying to prolong the holiday a bit I suppose! Some years ago I made pâté so I will be looking for a good recipe for a simple pork pâté to try out, I have a crepe pan and as I have some French buckwheat or sarraisin flour we can have galettes. I would also like to try to replicate some more French patisseries: Tarte au Citron and Le ‘Far’ Breton are family favourites. During our holiday in the Languedoc, we managed to sample just a few of the regional specialities and I wanted to record them here. The excellent book ‘Hot Sun, Cool Shadow’ by Angela Murrills, which I have already reviewed, was a great help and without it we probably would have missed some of these treats. One memorable meal out was at Sète on a very hot day. We found a very attractive square in deep shade just away from the Grand Canal and a restaurant which served only salads. A wonderfully cool and peaceful lunch followed. My husband enjoyed Carpaccio of Beef (thin slices of meat, usually raw) with fresh lime juice and slivers of parmesan, served with a green salad and Parmesan Ice Cream – unusual, but very tasty. My salad included Magret (sliced duck breast) and Tapenade (a paste made from olives spread on slices of French bread) – see below for further information. The Tielle is a round pastry filled with a mixture of octopus and tomato, although we sometimes saw packaging where it was mixed with other seafood, notably squid or mackerel. 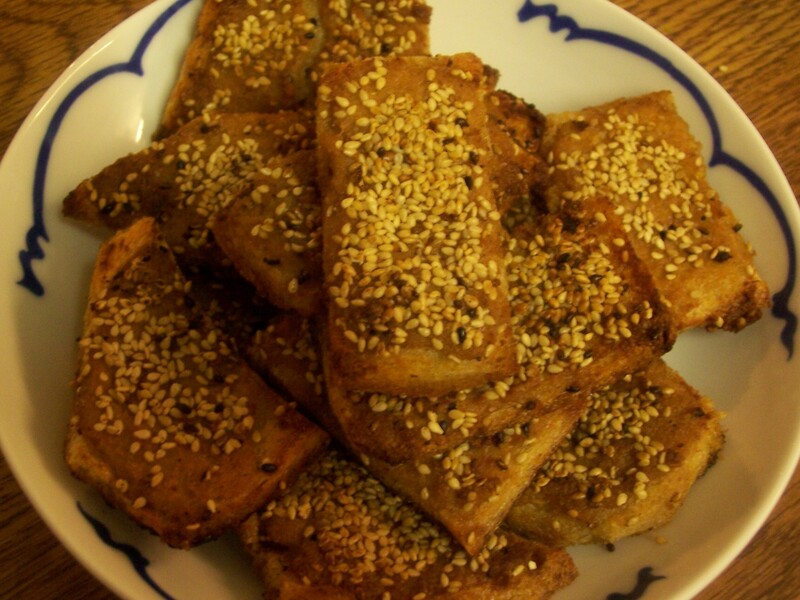 The traditional Tielle is sized as an individual portion but are quite generous. You can also buy a larger pie for several people, though not usually called Tielle, which has more filling of the same type to less pastry. The crust is pinched together in a distinctive style and the tomato sauce seeps through giving the pastry an orange colouring. It is said that Tielles were introduced to this region by Italian immigrants who settled in Sète and similar pies can be found in parts of the Italian coast. Unsurprisingly the pies had a strong fishy flavour – if you like pilchards or mackerel in tomato sauce you would certainly like these. I had not been sure what to expect but these were tasty enough for us to eat several during our holiday, sometimes as part of a picnic lunch and at other times as part of an evening salad meal with the local wine Picpoul de Pinot (see below). Pézenas is a interesting and well preserved medieval town. We spent a fascinating morning wandering round its old streets, looking in shops and galleries and enjoying its quiet corners. We had heard about the famous Petits pâtés de Pézenas or Pézenas pies and were eager to try them. These small pies in the shape of a bobbin or cotton reel are a speciality of the region, supposedly introduced in the mid-18th century by Robert Clive of India (who came from near Market Drayton in Shropshire) when he stopped over in the town. His Indian cook invented the pies from the available local ingredients giving the recipe to a local pastrycook called Roucairol, although the exact details vary from one account to another, some telling that Clive invented the pies himself. The Très Noble et Très Gourmande Confrérie du Petit Pâté de Pézenas have a ceremony every Ascension Day and dress in extravagant robes and control the quality of the product. The pies contain a filling of minced lamb, brown sugar, candied lemon rind and mixed spice which is rolled up in hot water crust pastry. They are available from the numerous Patisseries in town, some with informative websites, but the pies seemed quite expensive for their size. Ideally the pies should be eaten hot and served as a starter with a glass of wine (either dry or sweet) but this was impossible for us as we bought them as an extra for our picnic so just had one each as a taster. They were delicious lemony sweet mouthfuls with a sticky surface and just a hint that they might contain meat, but I am not sure I would have guessed. One pie was not really enough but sadly we didnt get a chance to try them again. I enjoyed Tapenade spread on toasted French bread as part of the salad I ate on our visit to Sète. The classic version of this Mediterranean favourite is a grey/black paste and looks fairly uninviting but tastes great, providing you are a lover of olives. Tapenade can be purchased in the local supermarkets but is very easy to make. Variations include tapenade made with anchovies (BBC – James Martin) and Sundried Tomatoes and basil (Delia Smith online). I had this local speciality as part of another favourite restaurant dinner. I was determined to try squid and was delighted with this dish of dark strips in a creamy golden sauce, served with rice and french beans. I had not been sure what to expect but the taste was quite strong, both meaty and fishy in a sauce the waiter told us was Rouille, the recipe for which varies. There are other recipes for Rouille using red peppers (capsicum), saffron or mayonnaise. We tried tiny red peppers similar to these (no bigger than a horse chestnut conker) in several restaurants. They were stuffed with tuna paste and dripping in the olive oil in which they had been preserved. We found them in the supermarket as well, either pre packed in jars or on the counter which served marinaded olives to order. Does anyone have the French name for them please? The Picpoul vineyards overlook the oyster and mussel farms of the Étang de Thau and the grapes are grown on the limestone plateau. The light, dry white wine comes from a single grape, the Piquepoul or Picpoul (also various other names), which has a fresh and fragrant smell which we felt was similar to wines we had enjoyed on previous holidays, such as Muscadet. As with Muscadet, Picpoul de Pinet is recommended to be drunk with seafood but we enjoyed it with other food and brought a number of bottles home. Sète is located at one end of the Bassin de Thau, a large inland lagoon famous for its oysters and mussels, which are raised on table type metal structures. On a circuit of the lake we enjoyed in particular the colourful restaurant lined harbour at Mèze and Marseillan, where the famous Noilly Prat Vermouth is made. Cantal Cheese Each year we enjoy trying the cheeses on the regions we travel through and in the past we have made some great discoveries. Not a speciality of the Languedoc about which I have mostly been writing, Cantal Cheese comes from the Departement of Cantal in the Auvergne, part of the French French Massif Central and was this year’s favourite. It is a hard cheese with a creamy slightly acidic taste and we ate rather too much at lunchtimes with our French bread. We were pleased to find that Super-U did a pre-packed own branded version though it would be interesting to try cheese brought from a specialist shop. Putting a passion into words, explaining why you are smitten with anything – a person, a job, a country – is never easy. But in the case of the Languedoc, the land speaks for itself. The appeals of its thyme-scented garrigue (the rough scrub that covers the inland hills), idyllic pastureland and sun-baked valleys are self-evident, but it’s the abrupt flashes in temperament that delight us, the distant mountain crags that suddenly encroach on a serene valley, the fertile plains that give way to flawless beaches, the eerie flat landscape of the Camargue and the coastal lagoons known as ètangs. Food critic and writer Angela Murrills along with her husband, Peter Matthews, an artist who charmingly illustrates this fascinating book, recounts their journeys of discovery through Languedoc in the South of France, whilst searching for a French second home. We discover the people of this region with their ancient customs and language and Murrills recounts its long and sometimes troubled history. I was particuarly interested in the information she gave about us about the Cathars, persecuted for their Protestant beliefs, who held out in fortress strongholds such as Montségur in the Pyrenean foothills; about the building of the Canal du Midi, an impressive feat of engineering started in 1666, linking the Mediterranean with the River Gironde, which runs into the Atlantic Ocean; about the life of the locally born artist Henri de Toulouse-Lautrec and about the places which caught the eye of painters such as Henri Matisse and Charles Rennie Mackintosh, one of whose paintings they find semi-forgotten on the wall in a small hotel. Murrills takes us through Languedoc not only area by area but dish by dish too as this is also a culinary journey and she gives information about regional wines and drink, food preparation and the varied cuisine, including some local recipes for the reader to try at home.